For this blog posting I would like to share with you the story of a giant in our history. As with last month’s post, these remarks are largely taken from the Chapel Talk I gave in the spring of 2013. In Archives work there is a concept that lots of copies, kept in separate places (and in this case in different formats) keeps things safe so it seems to me that sharing this content via a blog might just be a good idea. On with the story, part of what is so interesting about this giant is that while he had tremendous impact on the Wabash of his time, and of ours too, he is rarely mentioned. Dean George Kendall served Wabash, officially, from 1920 until 1957. Following his retirement, he moved back to the East, but like so many before and after him, even in retirement, he worked on behalf of Wabash for the remainder of his life. George Valentine Kendall was born in Kirkwood, Missouri on February 14, 1891. His Valentine’s Day birth was the source of his unusual middle name. His parents were upper middle class, both college educated, his father was a doctor. When it came time for George to go to college, he attended Brown University and developed a love of the theater. He appeared in plays during college and served as president of the Sock and Buskin, the theatrical society of Brown. Kendall also spent a great deal of time in other theaters as well. Based on the collection of vaudeville programs in his papers, it’s amazing that he had time to attend any classes. But he must have done and given that he was a Junior Marshall for Brown’s commencement and a member of Phi Beta Kappa, we can infer that he did quite well in his studies. For graduate school he went to the University of Wisconsin where he earned his Master’s degree. He then went on to Columbia where he roomed with Insley Osborne [W1906] son of longtime faculty member Pat Osborne and one of our first Rhodes scholars. As with so many men of that time, George’s plans were suspended for World War I. In France George served as an artillery instructor and it was there during the war that he met and married Yvonne Guyer, a shy beauty he always referred to as his “Alsatian lass.” Upon their return from Europe, the Kendalls lived in New York where George returned to his studies at Columbia. City life was hard for Yvonne who was more at home in the country. 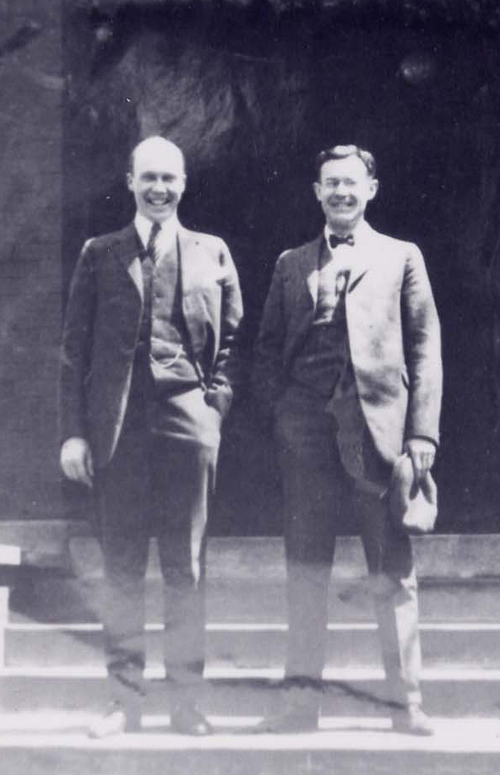 When Wabash was in need of a man to teach English, Insley Osborne recommended his friend George for the position and in 1920 the Kendalls moved to Crawfordsville. It was not long before George became a valued young member of the faculty. In just three years he was named Dean of the College and served as dean for sixteen years, longer than any other. It is important to understand that at this time, there was only one dean. Kendall was Dean of the College, Dean of Students and Dean of the Faculty – all in one. It was a big job. A faculty resolution offered at this retirement notes that his work was divided among, “no fewer than four members of the present faculty.” He also taught two classes during his time as Dean! 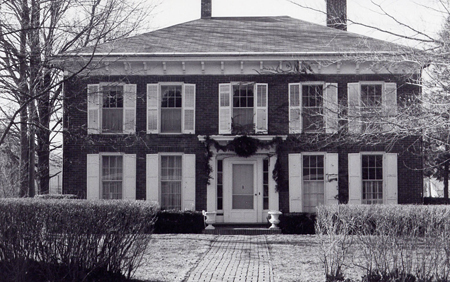 Kendall House – donated by George and Yvonne to the College was the site of many gracious evenings. During the Hopkins administration the Kendalls served as hosts to most guests of Wabash. 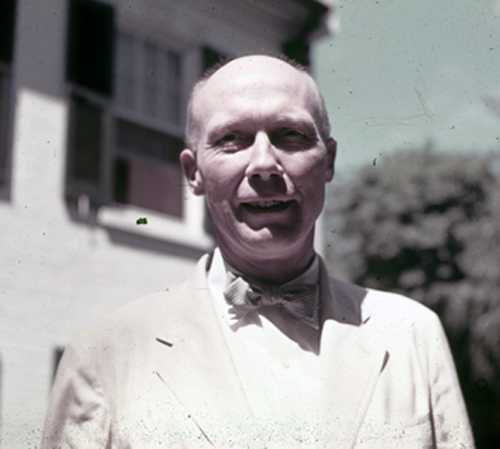 This view of Kendall is also present in another address for his memorial, Walt Fertig – Wabash man and long-time faculty member in the English department – spoke of George in this way, “He was tall, big-boned, built on a kind of heroic scale, with a beautiful bald head and piercing blue eyes…Immediately, you knew he was a person with whom nonsense or pettiness would get nowhere. Kendall was a powerfully impressive dean.” Fertig notes that he believed in men taking care of themselves and that Kendall’s ideal college was a college for men, not a school for boys. Kendall was the first member of the faculty to leave Wabash for the military in WWII. After Pearl Harbor, he lobbied a Wabash man, General Charles D. Herron, for a position in the Army. He was sent to the South Pacific where he served on the staff of General MacArthur. Kendall finished the war as a Lt. Colonel. He returned to Wabash after the war as Dean of the Faculty and served as a mentor to the new Dean of Students, Byron Trippet. Kendall retired from Wabash in 1957 and moved to Massachusetts to live near an old college friend. In letters from that time he notes that he is determined to, “get clean out of the way.” We can see that this was wise by reading the faculty resolution created at his retirement which notes, “No member of the Wabash faculty has ever carried more responsibility or commanded more respect than George Kendall. The embodiment of urbanity and of unassuming academic and executive efficiency, he impressed generations of students, faculty members, and trustees with his limitless talents.” It was clear that his was a long shadow. I have often wondered if one of the primary reasons Kendall left Wabash when he retired was to ensure Byron Trippet’s freedom to lead as the new Wabash president. In many letters George wrote after his retirement, there was often a wistful quality, a longing for this place, and yet he knew that if he were around, the thoughts of “What would George do?” might be a hindrance to others as they tried to lead. Kendall lived for another 15 years after his retirement. By all accounts it was a full and happy retirement with many pleasant visits from friends among the Wabash family. I will leave you with a couple of quick stories gleaned from the letters which came to his widow following his death. One was particularly striking, from a Wabash man who had long since graduated. As the alum tells the story, he was doing very poorly in his accounting class and wanted to drop it. He also had terrible headaches. Dean Kendall recommended that he have his eyes tested, perhaps he might need glasses. Decades later, this former student was a very successful accountant and head of his state association. He credited Kendall with his lifelong success. The second account came from a former student who had been having trouble making his 8:00 classes. Kendall recommended that the student drink large amounts of water before going to sleep as the need for the men’s room might just prompt him out of bed. This suggestion was so embarrassing to the student that he was never late to class again. And there were dozens like these from men whose lives were changed for the better by the tough, yet fair, Dean of Wabash. I hope that you have enjoyed this close look at one of the giants of Wabash College, a man whose influence lingers still.